When I found out that it was invented by a Dallas mom I had to find out more. After many years of trying to have children, I finally gave birth to a beautiful little girl. At that time, I had a very successful accounting practice and was working a lot of hours. I was very unhappy being away from my daughter so much so I decided to close my practice. I knew I was not going to completely quit working. I wanted to find something I was passionate about but could work on while being with my daughter. I have always been envious of people who were passionate about their work and have always wanted to be one of them. After a lot of soul searching, I decided my passion was cooking. I didn't have enough recipes to write a cookbook and a restaurant or catering business was out of the question because of the long hours they required. I also did not have a food product that I felt was unique enough to market. Then, one day, I was in a store and passed by the slow cookers. I remembered making a comment probably 10 years before that I loved my slow cooker and did not understand why it only cooked a one pot meal. I had seen cookers that were divided in two but even that seemed inadequate. Why can't it cook an entire meal? That being an entrÃ©e and two separate side dishes. After all, that is the type of meals we eat. Something kept nagging at me. What is a slow cooker? It is just a small oven that cooks at a low temperature. So, why won't it work? This was when I took the first step down the path and built the first very crude prototype. I was very pleased when the first prototype really did work. It really cooked the meal. I did a lot of research to see what was on the market and did a survey of my target market to determine if there was any interest in a product like this. The results were very encouraging so, I continued working on the prototype and located a manufacturer who could make the product for me. After 3 years of developing the prototype and working with the manufacturer, I have just introduced Slow Cooker Mateâ„¢ to the market. I hope this product will make it easier for Moms to put a nutritious meal together for their families and give them more time to enjoy their families. 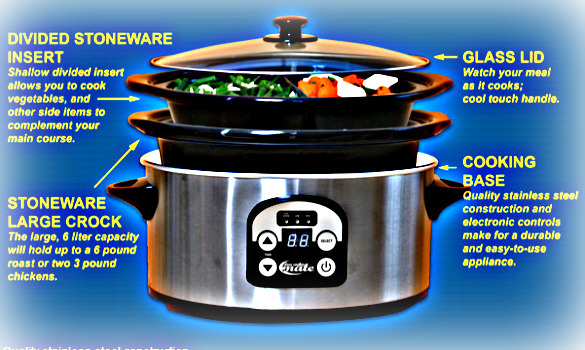 More information about Diana, the Slow Cooker Mate and recipes can be found at their website. ……..Slow cookers are one of the most useful appliances you can have in your kitchen even more so if.you dont enjoy cooking or you have a busy schedule that keeps you running around and not working over the stove. In addition everything cooks together which means that.youll only have one pot to clean.